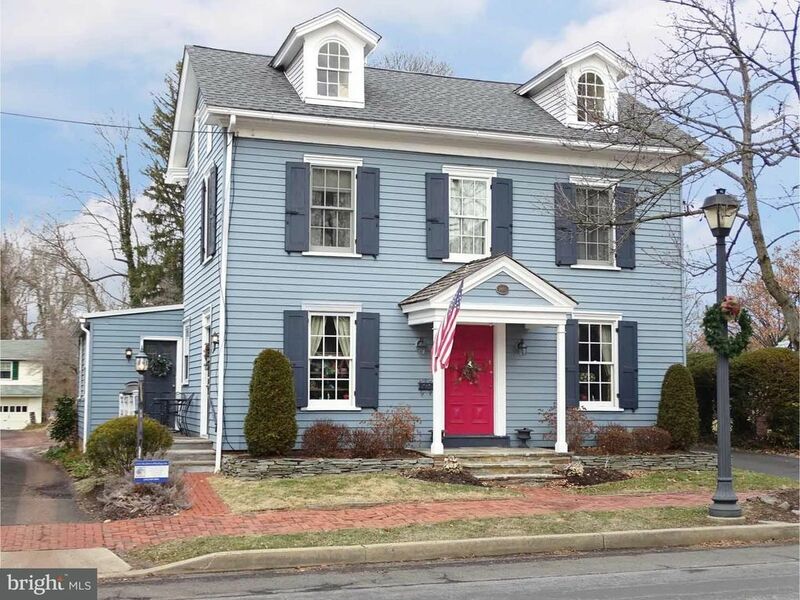 Located in the heart of historic Langhorne Borough, this 1857 colonial has maintained its character and charm while integrating modern conveniences for a comfortable living space. A portico entrance leads to a spacious living room highlighted by the distinctive original fireplace with Valley Forge marble mantel and surround (non-functioning); oak floors, built-ins, and lots of natural light. Beautiful hardwood floors flow throughout the entire home. An impressive dining room features a working, recently rebuilt gas fireplace, with distinctive Mercer tile surround and raised hearth; abundant built-in storage; attractive chandelier; custom moldings and a picture window. The eat-in kitchen, updated with granite countertops and stainless appliances, has maintained a historic feel that you will fall in love with, and features Mercer tile backsplash, a shared gas fireplace with antique cast-iron doors, pantries, and side-entry with covered brick porch. Completing the main floor, you will find a mudroom with laundry and charming powder room. Ascend one of two staircases up to the second floor where you will discover a private family room space off the master bedroom (potential space for master bath), 2nd bedroom, office/bedroom, and an updated full bath. Another staircase will lead you to the third floor with two additional large bedrooms and a large storage space. Access to the unfinished basement from Bilco doors on right side of house. Worth mentioning: new roof (2017 on main house, 2013 on office and flat roof), new windows (2015, all except 3rd floor which has leaded windows); 4-zone heat (2012); 5-zone Central Air (2009); detached 2 car garage with parking for 5 vehicles. Home also features attached professional office/business space with private entrance, reception area, 3 rooms, and a powder room. Can be expanded if more space needed into the living room of main house.